Use food color to tine desserts, candy, cakes, cookies, and cake frostings. Add coloring gradually until the desired hue is achieved. Blend 1/2 tsp green food color, 1/2 cup confectioners sugar, and 1 tbsp milk for a jungle green glazed icing. Easter Egg Dyeing: Add 1 tsp vinegar and 1 tsp green food color to 1/2 cup boiling water. Dip hard cooked eggs for 5 minutes or longer. You can create other coloring options by combining two or more food colorings. To make other colors, blend two or more colors. See our Food Color Mixing Guide. 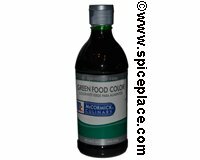 Ingredients in McCormick Green Food Color: Water. Propylene Glycol, FD&C Yellow 5, FD&C Blue 1 and Propylparaben (as a preservative).